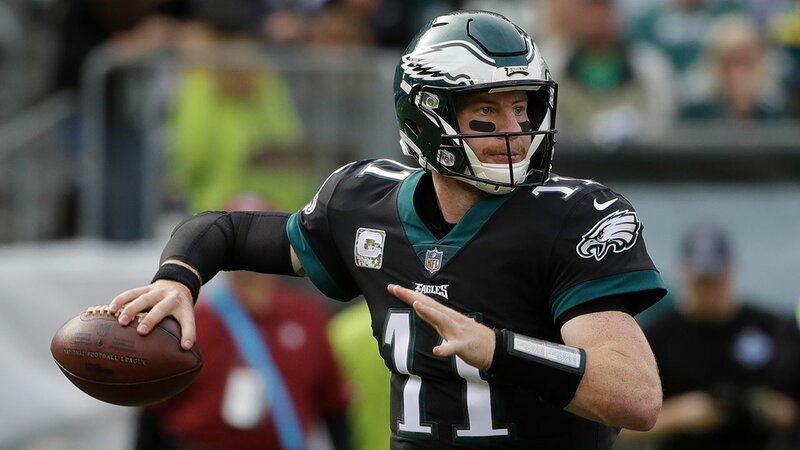 PHILADELPHIA -- Carson Wentz tossed four touchdown passes, Corey Clement had three scores, and the Philadelphia Eagles routed the Denver Broncos 51-23 on Sunday. The Eagles (8-1) dismantled the league's top-ranked defense, racking up 419 yards, to win their seventh straight game and head into a bye week with the best record in the NFL. Brock Osweiler couldn't get the Broncos (3-5) on track in his first start since rejoining the team in September. He threw two interceptions. Denver has lost four in a row and five of six. Wentz was 15 of 27 for 199 yards before giving way to Nick Foles. He has three four-TD performances in the last five weeks. Clement had two TD runs and one TD catch, and newcomer Jay Ajayi ran for 77 yards and one score. Wentz flipped a 32-yard TD pass to Alshon Jeffery to give the Eagles a 7-3 lead after a holding penalty on Broncos cornerback Aqib Talib extended the drive. Talib bit on a faked inside handoff to Ajayi and Jeffery ran past him to make the catch and score. After Osweiler threw a pick right to Patrick Robinson later in the first quarter, Wentz threw a short catch-and-run TD pass to Clement on third-and-10 from the 15. A roughing-the-passer call on Denver's Zach Kerr kept another drive alive for Philadelphia. Wentz connected with Trey Burton on a 27-yard TD pass on the next play, giving the Eagles a 24-6 lead. Ajayi burst through for a 46-yard TD run to put Philadelphia ahead 31-9 in the second quarter. Ajayi, a 2016 Pro Bowl pick with Miami, was acquired in a trade Tuesday. The Broncos hadn't allowed 30 points in a game this season, nor any TD runs. Clement, an undrafted rookie free agent, ran in from the 2 in the third quarter, and Wentz connected with Jeffery on a 6-yard pass to make it 44-9. Clement's 4-yard TD run capped the scoring. The Eagles hadn't scored 50 points since a 54-11 victory over the Bears on Dec. 22, 2013. The last time the Broncos allowed more points, they beat the Cowboys 51-48 on Oct. 6, 2013. But Peyton Manning isn't around anymore. For one play, Denver's defense looked like its old self. Von Miller stripped Foles and Brandon Marshall scooped up the fumble and ran it back 19 yards for a TD. Clement had 51 yards rushing, LeGarrette Blount added 38 to go with Ajayi's 77, and the Eagles got 197 on the ground. Broncos receiver Demaryius Thomas caught his first TD pass this season, a 1-yard grab in the fourth quarter. It was the first TD catch for the five-time Pro Bowl receiver since Nov. 13, 2016. Denver's Brandon McManus kicked field goals of 52, 53 and 24 yards. He was only 10 for 15 coming in and 8 for 17 in his career beyond 50. Broncos: WR Emmanuel Sanders started despite being listed as questionable with an ankle injury. Eagles: TE Zach Ertz didn't play because of a hamstring injury sustained in practice. Broncos: Host the New England Patriots (6-2) next Sunday. Eagles: Have a bye before visiting Dallas (4-3) on Nov. 19.